Source: Key to Toronto, August 1970. 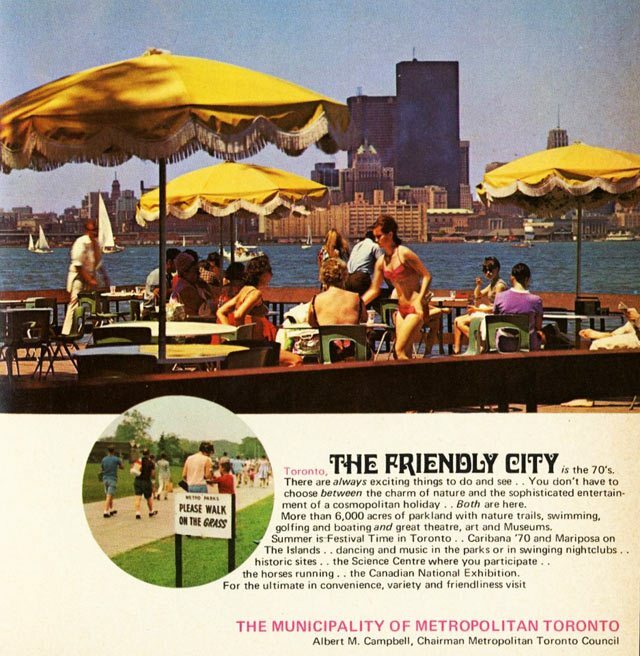 As the 1970s approached, Toronto seemed primed to throw off its old cold, unfriendly shackles. The puritanical laws which had cut down on fun, especially regarding alcohol or doing anything on a Sunday, were slowly loosening. The city’s increasingly multicultural mix boosted the number of summer festivals residents enjoyed, opening new worlds to tourists and long-time Torontonians alike. This thawing may have inspired tourism officials to promote our town as “The Friendly City,” even if making that a reality took baby steps. The signs were the brainchild of Metro Parks Commissioner Tommy Thompson. Hired as the department’s first employee in July 1955, Thompson spent the next two decades cultivating the region’s natural beauty into over 7,800 acres for the public to enjoy. “We saw our job as wilderness management,” Thompson told Weekend magazine in 1972. “Letting the land express what it was meant to express.” Instead of installing elements like baseball diamonds, Thompson saw the mix of open spaces and flora as places where people could just enjoy themselves. A map spotlighting recreational spots around Metro, including some of the parks under the direction of Tommy Thompson. Toronto Star, May 6, 1967. A young couple are madly in love with each other and in the park they carve their initials together on a tree. Now, 20 years later, they return to that spot, maybe with a few children, and they look into each other’s eyes and relive that wonderful, youthful moment of love. I’ll be damned if I stand in the way of that. 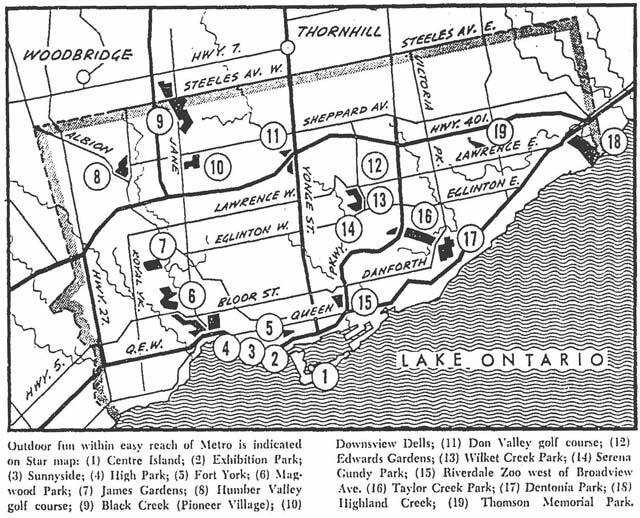 During a meeting in 1969, Thompson was challenged on his assertion that one could take a 10.5 km walk through the geographic centre of Toronto without crossing a paved street. To prove his point, he led up to 400 people on a stroll through the central Don park system. This began a long series of walks with the public, where he pointed out natural highlights with his wooden snake adorned walking stick. Not everyone admired Thompson’s commitment to expanding green space. He supported the eviction of the remaining residents of the Toronto Islands to create more parkland. There were also signs of a thin skin, as he sometimes threatened to quit whenever his decisions were challenged publicly. Generally, he was regarded as an able administrator called in to fix administrative problems, especially at the Metro Toronto Zoo, where he served as director between 1978 and 1981. The impact of the sign’s message lives on, as seen in this ad promoting other municipal environmental efforts. Globe and Mail, May 31, 2002. 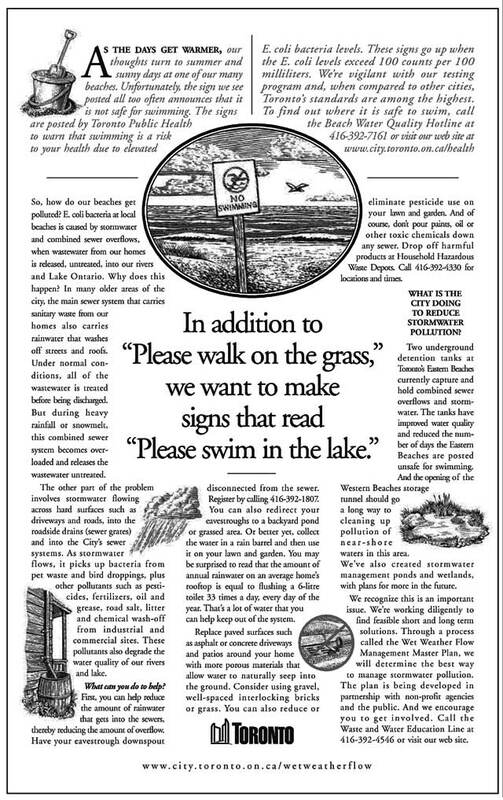 When Thompson died in 1985, everyone referred to his “please walk on the grass” signs, which he admitted came about after he told a sign company to change the wording on what were supposed to be “keep off the grass” warnings. The growing parkland along the Leslie Street spit was named Tommy Thompson Park in his honour. Additional material from the August 17, 1965, April 14, 1982, and March 2, 1985 editions of the Globe and Mail; the August 18, 1958 and March 1, 1985 editions of the Toronto Star; and the June 17, 1972 edition of Weekend.